Rotterdam is The Netherland’s second city (even though everyone in Rotterdam will contradict you on it), but with its giant port, stunning skyline and mindblowing architecture, the city may just trick you into thinking it should come first. 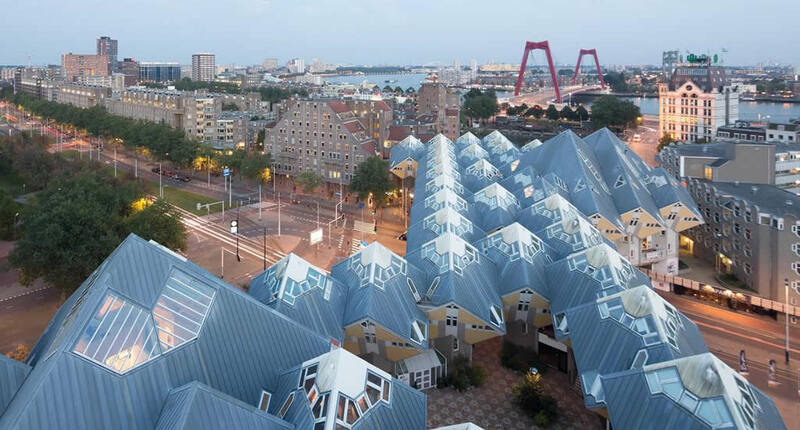 Even though The Netherlands are quite known for their cunning architects (hello Rem Koolhaas!) 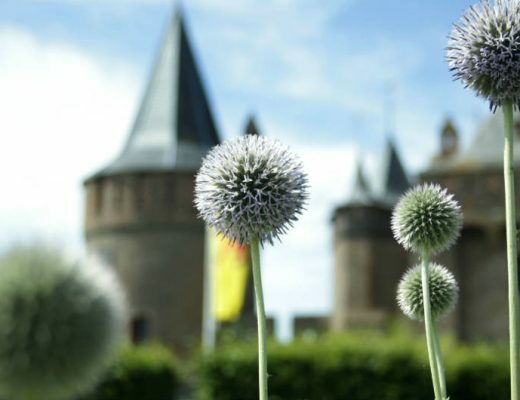 it’s only in Rotterdam that you’ll find some of the country’s most amazing architecture all within walking distance. 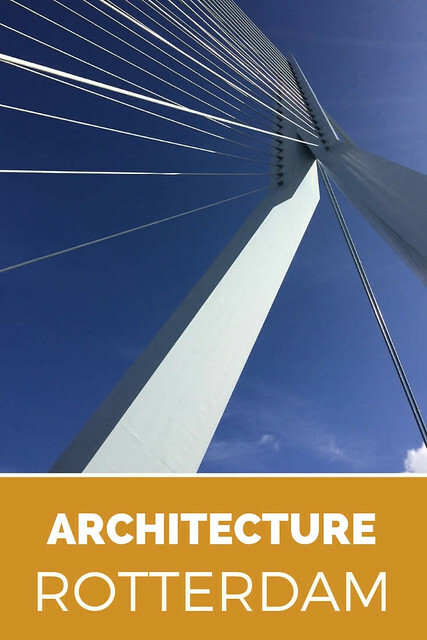 Take a day to explore architecture in Rotterdam. 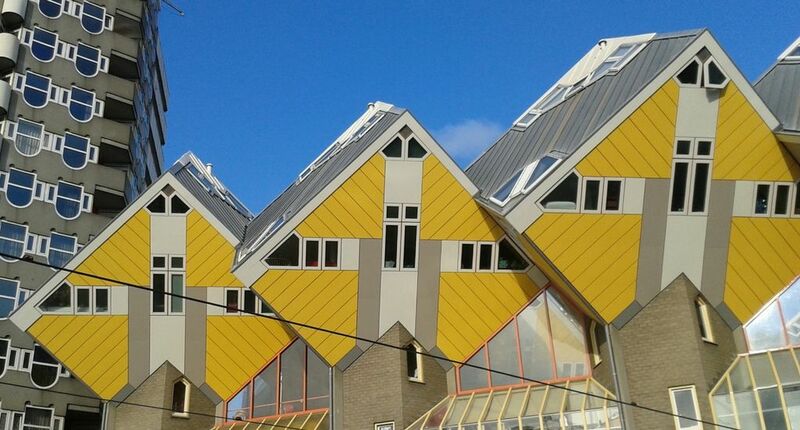 Maybe you’re wondering why there is so many interesting, modern architecture in Rotterdam? Well, the reason is both a logical as a sad one. During the Second World War, in May 1940, Rotterdam was basically completely bombed to pieces by the German army. So many bombs were dropped on the city that it burned to the ground in less than 15 minutes. After the war, instead of reconstructing the city as it once was, Rotterdam decided to rise from the ashes and give way to the many talented architects that stepped up after the liberation of The Netherlands, resulting (amongst other things) in the most spectacular skyline in The Netherlands. One of the most iconic sights along the Rotterdam skyline is Euromast. Built in 1960 and until this day the tallest man-made structure in The Netherlands, with a hight of 185 meters. 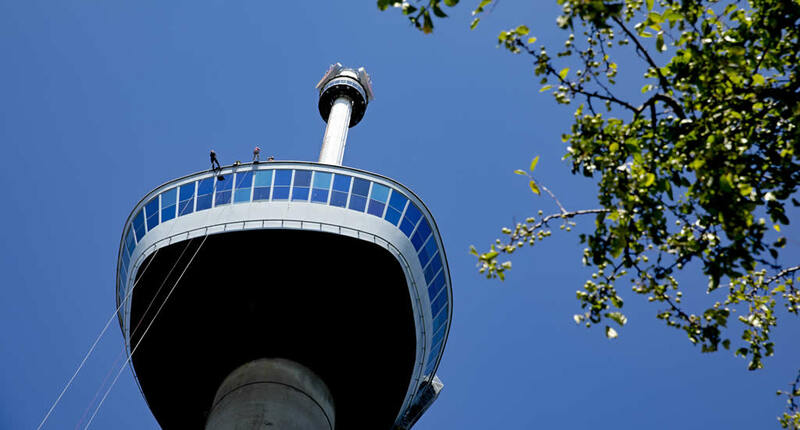 I think that first-time visitors of Rotterdam definitely have to venture up the tower to enjoy the amazing views over Rotterdam from the viewing platform. Since the Maas river flows through Rotterdam, different parts of the city are connected by many impressive looking bridges, like the red Willemsbrug. The most famous bridge is the Erasmusbrug (Erasmus Bridge) and for many people the ultimate symbol of Rotterdam. It’s 139 meters high and affectionally knick-named The Swan by locals. 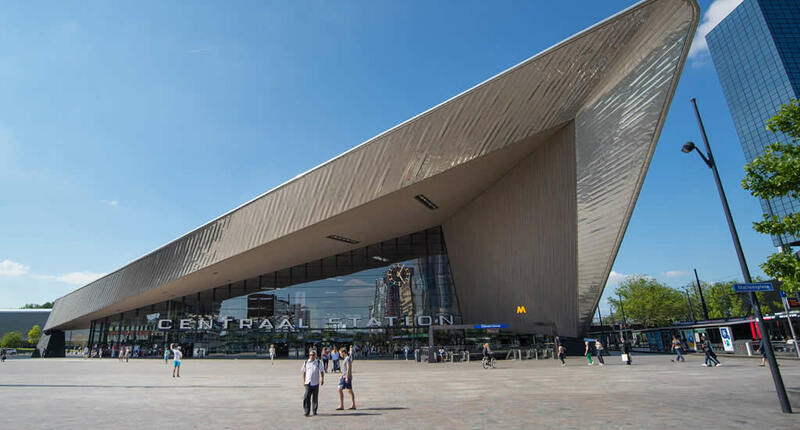 The new central station of Rotterdam has only been reopened recently, as it underwent reconstruction for many years. The new station is marked by a stainless steel and glass roof, pointing towards the heart of the city. The inside is completely clad in wooden beams, creating a welcoming atmosphere for visitors. Dutch architecture Piet Blom designed these award-winning Kubuswoningen in the early 1980s and they’ve been a colourful eye-catcher in the city ever since. The 40 yellow, tilted cubes are built on concrete pillars depicting colourful trees, which made a nice change from the pretty drab Rotterdam city centre in the 80s. The cubes are actually designed to live in and Blom saw his creation as a peaceful community and a way to live secluded from the bustling crowds in the city below. It’s currently possible to visit one of the Cube Houses as well as stay in one for the night. 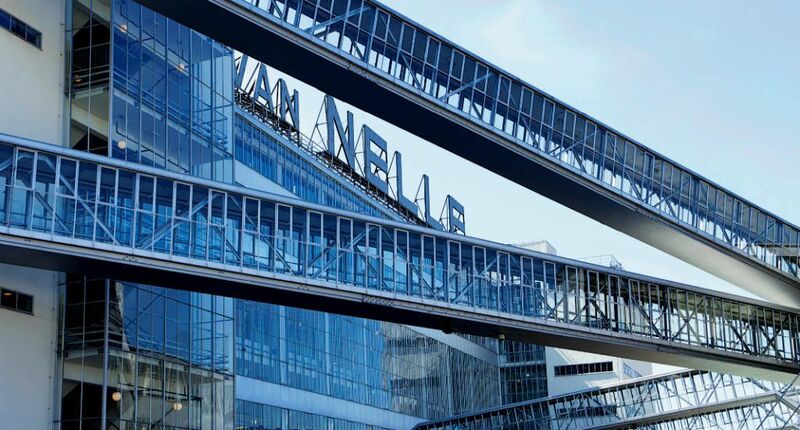 One of the most recent architectural highlights in Rotterdam is Markthal, across from the Cubic Houses, which was opened only a few years ago. The horseshoe-shaped building with its colourful ceiling holds Rotterdam’s new covered market hall as well as over 200 apartments. The market hall is both a great place to buy daily groceries, as well a good spot for lunch (I would recommend going for dinner in the surrounding restaurants). For me, this is the most stunning building in Rotterdam. 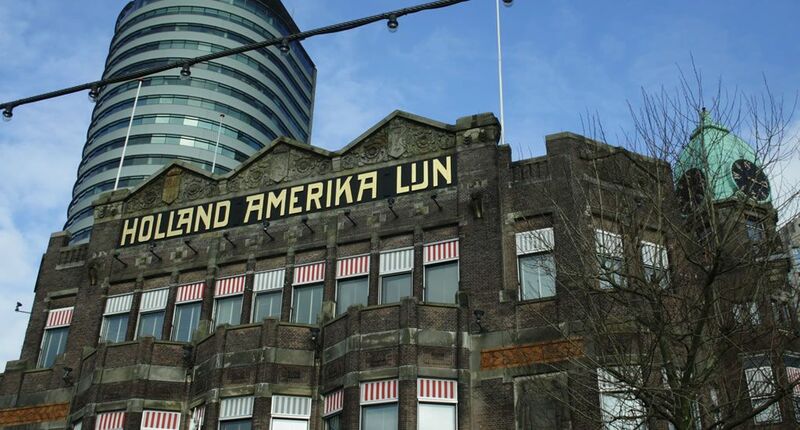 It used to be the headquarters of shipping company Holland America Line and it still represents the lives of thousands of Europeans setting off to American from this place. Hotel New York‘s Jugendstil façade still breathes the atmosphere of a time long gone. Inside, you can feast on excellent seafood in the restaurant, go to the barber’s or have a luxurious sleep-over. In my younger years (ha!) the Katendrecht area was not a place you’d wanted to go for a walk by yourself, both during the day as at night. The place was full of abandoned warehouses, shady businesses and industrial workshops. 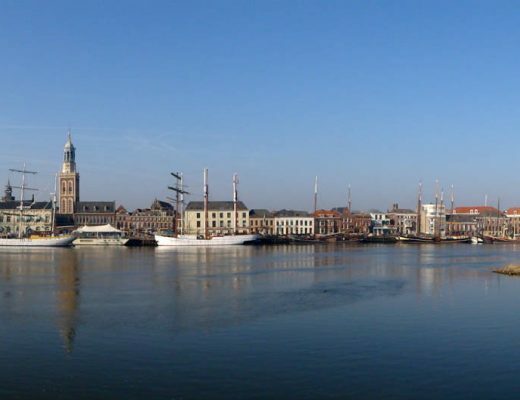 In recent years the once industrial sites have been rejuvenated and cafés, restaurants and creative entrepreneurs have claimed the old warehouses, bringing colour and life back into a place so characteristic for Dutch trade and industry. 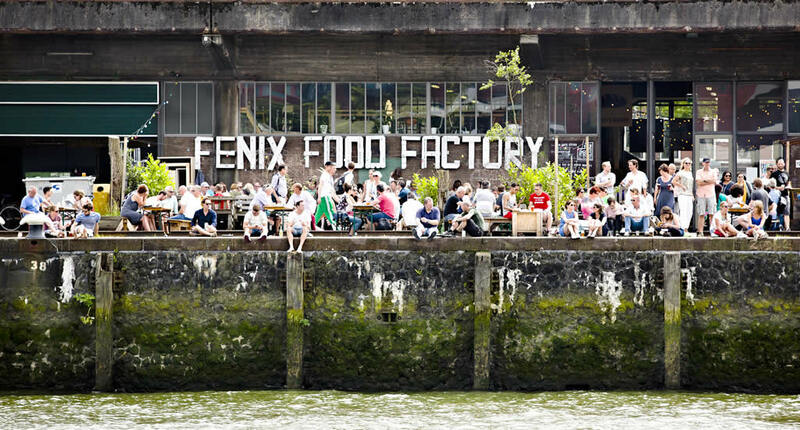 A fine example is the Fenix Food Factory which was initiated by a couple of food entrepreneurs from Rotterdam who wanted to join forces and thought the old harbour warehouse was the perfect place for locals to get their (organic) groceries, have some food or enjoy a drink together. Personally, I love going for a beer at craft beer brewery Kaapse Brouwers, taking my beer outside to enjoy the view over the iconic Hotel New York and city of Rotterdam. When hearing the term ‘Van Nelle’ most people will instantly smell coffee, as the former Van Nelle factory was a tea, coffee and tobacco plant built in early 20th-century industrial architecture. In 2014 it was listed as UNESCO world heritage. When the factory closed its doors the property was vacant and purposeless for many years, and I confess attending many a (maybe not so?) legal dance party there before the old factory was given its new function as an event venue, office space as well as a small and interesting museum. Even though Kunsthal was built to admire contemporary art within, the building designed by world-renown architect Rem Koolhaas, is also one to be marvelled at. The classic looking building feels spacious and that feeling continues inside where the bright and open plan rooms create the perfect atmosphere for hosting exhibits on modern and vintage design. 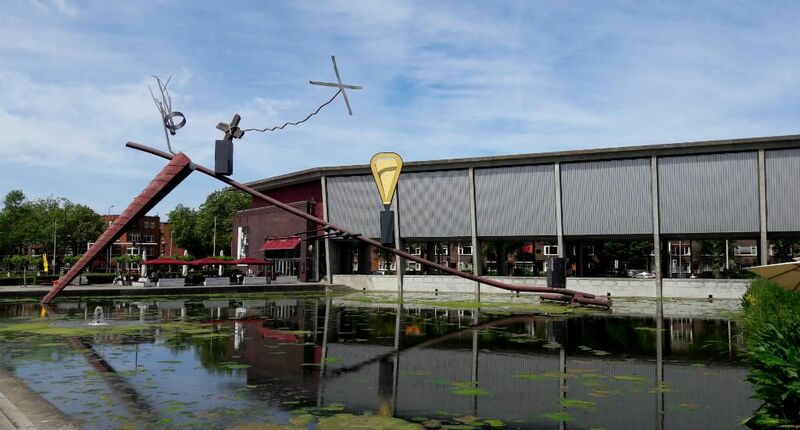 Museum Boijmans van Beuningen is maybe the most famous museum in Rotterdam and definitely a top museum in The Netherlands that should be on everyone’s to-visit list. 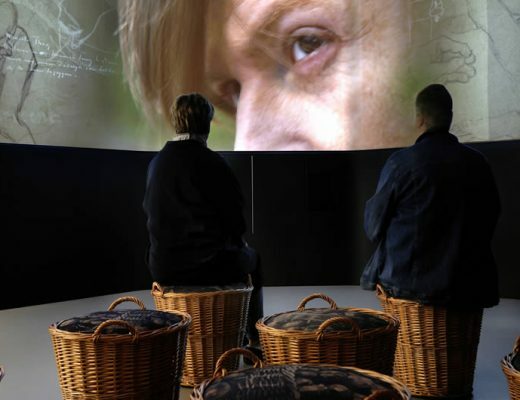 Visiting Boijmans is like travelling through time guided by Dutch art. 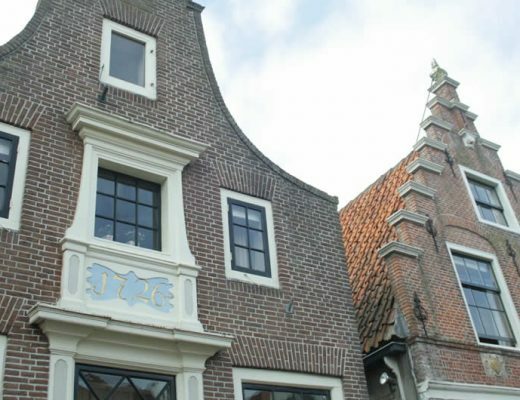 It’s the only museum in The Netherlands to own a work by Hieronymus Bosch, but also has works by Rembrandt, Van Gogh and Appel. The museum consists of three parts, with their own function and character. Currently, the museum is closed for renovation and will be opened again in 2020 when the museum will also open the doors to its brand new art depot. The building in which Het Nieuwe Instituut is set was basically designed to blend in with its environment. The materials that were chosen to build the museum, reflect those used in the surrounding area. And when viewed from the back its sharded façade remarkably reminds you of the recently reopened central station. The contemporary museum hosts exhibits on art, architecture and design and the café has a lovely deck which makes for a great lunch spot in summer. 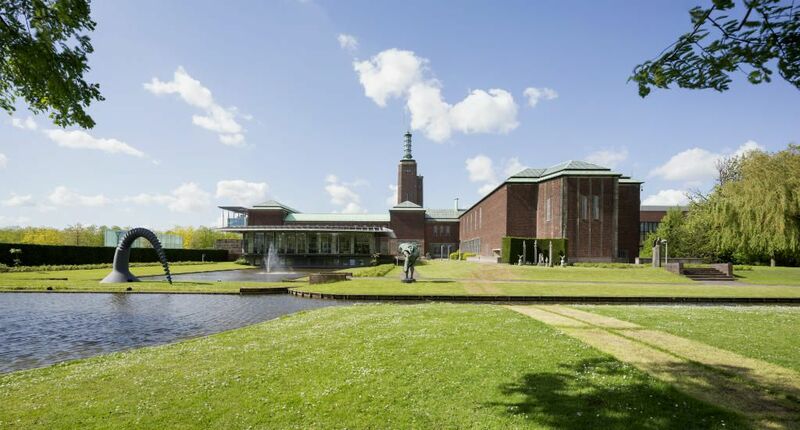 Boijmans van Beuningen, Kunsthal and Het Nieuwe Instituut are all part of Museum Park and can easily be visited in one day or one weekend. 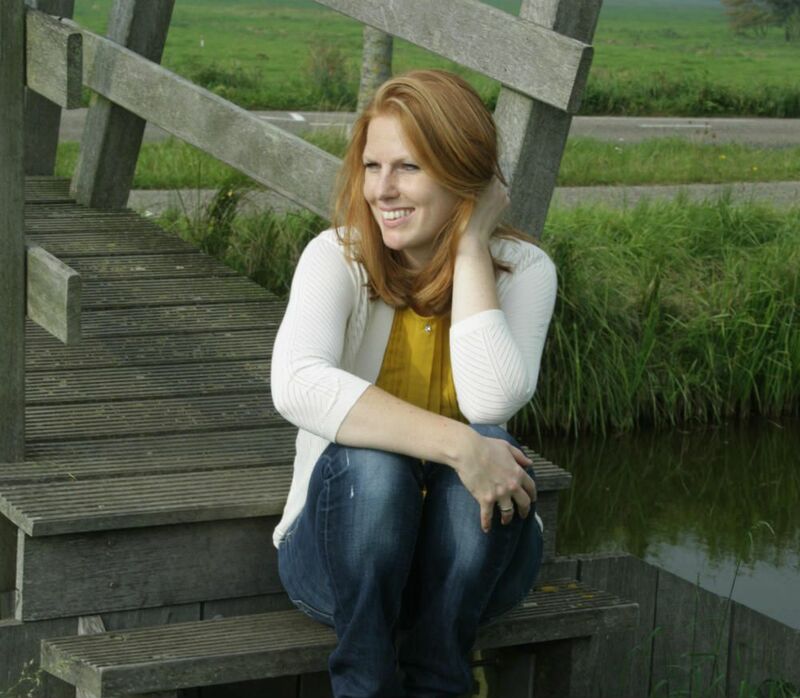 Check out my article on Rotterdam for art lovers. 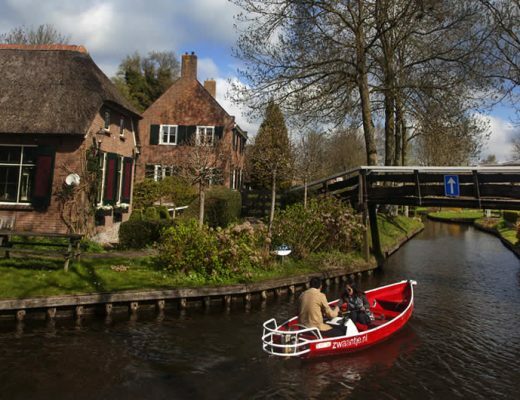 Do you know you can fly directly to Rotterdam from many cities within Europe? 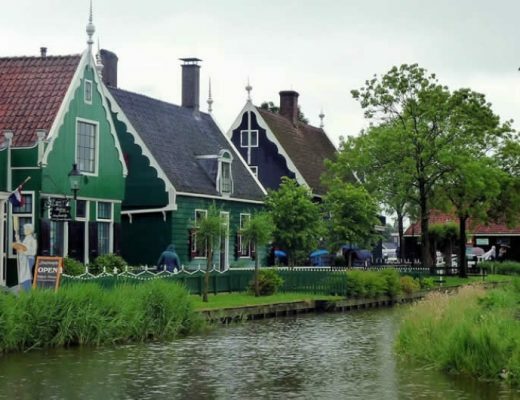 If you fly into Amsterdam, you can easily catch a train to Rotterdam. 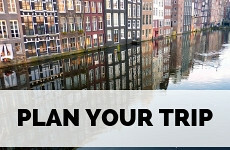 Trains run regularly and will take you to Rotterdam within the hour. To travel on public transport in The Netherlands, you’ll need an OV Chip Card, which you can charge as you go. Rotterdam is home to some of Holland’s finest hotels and if you’re into architecture, I recommend staying at Hotel CitizenM as it’s a stone’s throw away from the Cubic Houses and Markthal. 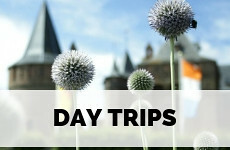 On weekend it’s a fun plan to join this bike tour and discover the amazing top sights in Rotterdam. Rotterdam is also a city to see some amazing street art and I have also written an article about my favourite Rotterdam neighbourhoods. 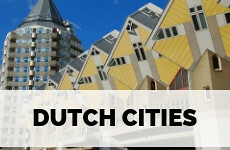 Plan your trip using my complete city guide Rotterdam. 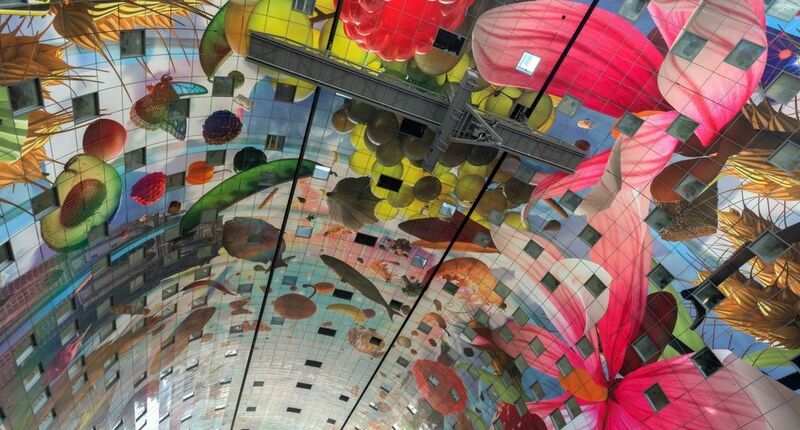 I love the colors of the Markthal!! So beautiful!! I was going to ask how the locals feel about the new Central Station because it seems so modern, but it seems Rotterdam is no stranger to modern architecture (how cool is the Cube House?!). I always love the different bridges – I always wonder what goes into choosing the design aesthetic for a bridge. I do like the modernist approach that Rotterdam took to reconstructing the city after the war. 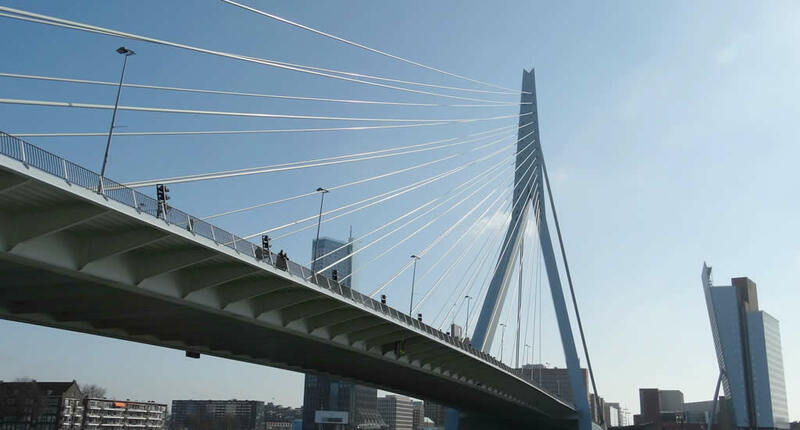 I have seen many recent bridges like the ones in Rotterdam and wonder if that is where architects got their inspiration from. Oh I went to Rotterdam many years ago – I remember the cube houses and Hotel New York. I need to go back and tick all the other cool stuff off the list! Such incredible modern architecture! How wonderful! 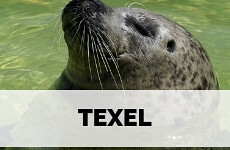 I am originally from Hull in the UK and I know that you can get the overnight ferry from my hometown to Rotterdam. Maybe I’ll get there one day? The bridges are especially amazing. I knew that Rotterdam was bombed to pieces, but I didn’t know it was rebuilt with such stunning architecture. Some cities like Nuremberg decided to rebuild in the original styles, and some like Rotterdam emerged as modern. That’s always fascinating to me! I hope to visit someday! I am really NOT a fan of modern architecture, but Rotterdam intrigues me and I would like to see it for myself one day because it’s not only modern but incredibly unique and fun! Architecture is one of my favorite things to experience when traveling. I’ve seen so many pictures of the cube houses and can’t wait to visit them in person. Thanks for all of the great suggestions.